• What is an ''Attorney-In-Fact'' and What Can They Do? • Are there benefits to starting my estate planning early? • Can I Protect My Disabled Child with a Special Needs Trust? • Does My Revocable Trust Protect My Assets From Medicaid? • Attention Spouses Of Nursing Residents! ; You Are A Target! • How Many Kinds of VA Benefits Pay for Nursing Home Care? • When Should You Discuss Your Estate Plan with Your Family? • How Do I Begin to Serve as Someone’s Power of Attorney? • What are Advance Directives & Why Do You Need Them? • Is Your Net Worth Considered “Too High” for Veterans’ Aid? • Should You Place Your Life Insurance Benefits in a Trust? • What are the Four Tests for Medicaid Eligibility? • Will Medicaid Pay for a Home Nurse for My Elderly Relative? • What is the Difference Between Medicare and Medicaid? • Walt Shurden Newsletter - Three powers to give your family to take some pain out of long term care. 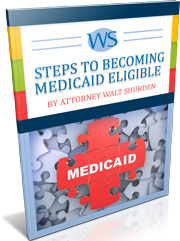 • Walt Shurden Law Newsletter - Should I move Money Out of My Single Parent's Name Before Applying for Medicaid? • Walt Shurden Law Newsletter - How do you think you compare to your 14 year-old self? • Walt Shurden Law Newsletter - "I got you? Babe"
• Walt Shurden Law Newsletter - Helpful Advice or Artful Contrivances? • Walt Shurden Law Newsletter - "Trapped"
• Walt Shurden Law Newsletter - Celebration for Dad or for the Merchant? • Walt Shurden Law Newsletter - What is Going on in the Lives of Visually Impaired Seniors? • Walt Shurden Law Newsletter - Not in My World! • Walt Shurden Law Newsletter - Change Your Estate Plan if Your Spouse Has Dementia. • Walt Shurden Law Newsletter - How I Get Away With Stuff at Home. And Why I Shouldn't. • Walt Shurden Law Newsletter - Florida Homestead: Did You Know? • Walt Shurden Law Newsletter - August 2015 "Does the Buck Stop With You? ", "Random Acts of Flowers"
• Walt Shurden Law Newsletter - April 2015 "Let's Go Places", "Who We Are: Malisa Jernigan", "What is FitBIT?" • Walt Shurden Law Newsletter - May 2015 "In Pursuit of Good Character", "Who we are; Jennifer Ake", "How To Give Your Opinion Online", "Probable Cause"
• Walt Shurden Law Newsletter - February 2015 "We All Have To Change", "Why We Live In Florida", "Mom Wanted Me To Get The Car"
• Walt Shurden Law Newsletter - Learn a new skill - Those crossword puzzles might not be enough. • Walt Shurden Law Newsletter - Groundhog Day is February 2nd But the Movie is Better! • Should I Change My Estate Plan if I'm a Caregiving Spouse? • Is There Veterans’ Aid for Assisted Living Facility Costs? • What Are the Different Types of Trusts? • Should the Family Home Be Sold to Pay for Long Term Care? • What are the Medicaid Rules for Giving Gifts to Your Family? • When Should I Apply for Florida Medicaid in a Nursing Home? • What Do I Need to Report on My Application for Medicaid? • Is Money in a Revocable Trust Counted by Medicaid? • How Long will My Medicaid Application Take? • Who Should I Hire for My Long-Term Care Planning? • Who Is Eligible to Receive Veterans’ Aid Pension Benefits? • What are Pooled Trusts & How Can They Be Beneficial? • When Does Medicaid Pay for Nursing Home Care in Florida? • Will You Pay Gift Tax on Assets Placed in Irrevocable Trust? • What is Meant by SMMCLTC in Florida Medicaid Terminology? • What is Going on in the Lives of Visually Impaired Seniors?